Ever been lost out riding? Scared of doing le TREC or endurance riding, because you’re worried you might not be able to find your way? Laureen Roberts, TREC and endurance expert, was taking no chances with the Ride 2 riders, and was determined to transform us into a crack team of orientation experts. 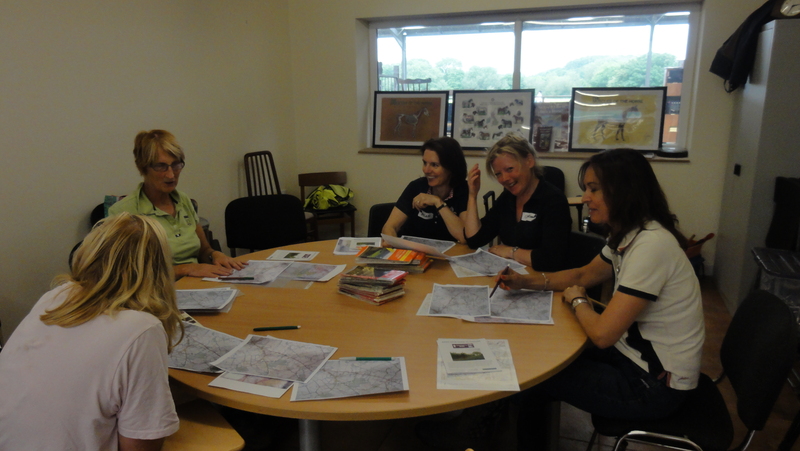 Laureen started off by talking about the various OS maps available. “Riders need the Explorer series, which shows field boundaries and gives highest level of detail,” she explained. “Horse riders are allowed to use bridleways, permissive paths, BOATs (Byways Open to All Traffic) and restricted byways. “Lost, us? Never!” L to r Liz, Laureen, Helen, Catriona and Chrissie. Laureen quickly ran through the procedure for competing in the orienteering phase of a TREC competition. Laureen handed out some maps, and we all marked the route. This practice exercise was to take place on foot rather than mounted, as it involved crossing a very busy A road. Laureen took us through the proposed route, pointing out an orchard, marshy area and buildings, as well as the points where we should expect to cross a road or track, then we set off in pairs. Liz and I set off first, crossing a small wooded area and stopping every few minutes to cross check with our maps. Unfortunately, we started chatting and got a little distracted, missing the stile that should have taken us into the orchard! We were quickly back on track, but Laureen reminded us that in a competition we could have missed out seeing the steward, and lost a lot of points. We checked off footpaths, trees, two minor roads, buildings, a small pond and a plant nursery, before crossing the main road back to the yard very pleased with ourselves. Unfortunately, we’d gone bounding off in such a hurry that we’d forgotten to put on our fluorescent tabards, and Laureen reminded us that in a competition, we’d have failed the equipment check. As well as being great fun, orienteering obviously has a very practical application. Next time it’s raining, why not get a local OS Explorer map, make up a practice route, and see if you can navigate round it?